With its generous 27 cm size and large handle, the Akileine foot file can be used quickly and easily. 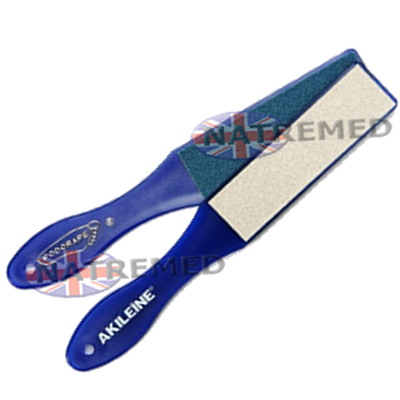 The file has 2 abrasive surfaces, each with a different colour: A coarse grained side to remove calluses and hard skin. The Next Generation Dry Foot Cream: For the treatment of Extreme Dryness, Hyperkeratosis, Cracks & Calluses. Repairs, reinforces and defends the skin from aggressions. Soothing and hydrating. Provides 66% Hydration after only 1 hour, The Hydration is Maintained Non-Stop for 24 Hours, Regular skin-moisture rate recovered in only 7 days, Aids and Speeds Cell Regeneration and Helps Heal Scarring and Damage. Uses only natural and efficient ingredients Silk Lipesters:-Restructures the Skin, Fights and prevents Hyperkeratosis, is also Anti-Bacterial. 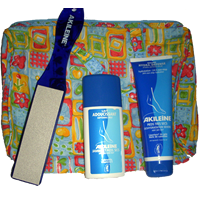 Akileine Softening Lotion:. The association of Calendula, Vitamin E and Essential Fatty Acids hydrates and smoothes the skin, making it soft and velvety from the first application. Relieves inflammation caused by hair removal, shaving, excess sun. The softening lotions is easy to apply and non-greasy formula. 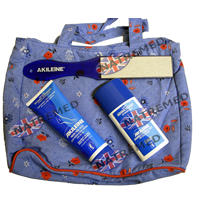 Akileine Regenerating Crème, Calluses and Thickening of the Skin, Cracked Heels: With Shea Butter and Wheat Lipoaminoacids. For hyperkeratosis. dry and very dry feet. Visible results after the first application. The unique combination of Shea Butter, Vitamin A and Glycerine softens, nourishes and makes dry and very dry feet supple again. Ideal for dry, dehydrated skin, cracked heels chapping and keratosis. The wheat lipoaminoacides balances the skin's pH naturally. It also hydrates and prevents the formation of callosities making the skin supple, soft and elastic again. Uses only natural ingredients. The 1, 2, 3 approach to Healthy, Good looking Feet. All Packed in an attractive cosmetic bag. Akileine The 1, 2, 3 approach to Healthy, Good looking Feet.